Fri, April 20, 2018 4:00 P.M.
Join Teen Central as we host the 8th season of the Philly Slam League. 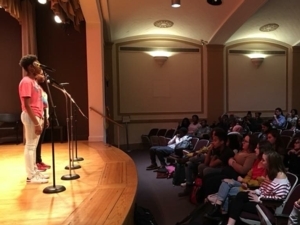 The Philly Slam League (PSL) is a non-profit organization that hosts poetry teams from Philadelphia-area high schools in a five-month intellectual and artistic competition. Teams come together weekly throughout the season to perform original poems in a three-round competition. PSL promotes networking, teamwork, school pride, writing, public speaking, and, most importantly, the growth of young people’s confidence. The public is welcome to join us in the Montgomery Auditorium between 4:00 PM and 6:00PM to hear the powerful voices of these young poets! For more information, contact Teen Central.